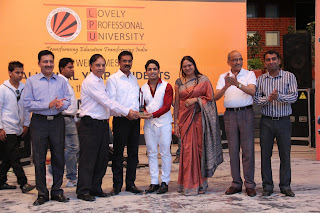 Jalandhar: This year-2013, more than 8000 passing out students of LPU are ready to face the world as its true global citizens. Of these 6600 are regular students and 1500 belong to distance education study programmes. In order to bid blissful adieu to these students, LPU organised its 8-houred long annual Commencement Ceremony, today. National as well as International Students were seen hugging, laughing while sharing fruitful outcomes of different sessions lived at LPU. On the one hand they were happy to enter new phase of their life, within a month’s time, on the other they were emotional on being separated from their class-fellows and alma-mater. To make memories persist forever, students underwent ‘Discipline” wise interactions at their respective schools, Stall Visits around University’s Sunken-stage and Bidding Adieu Tea at SBRM Square. Special celebrative entertaining arrangements were through class singing-performances by ‘Sa Re Ga Ma Pa’ star Shahnaz Akhtar, who sang for their choicest songs. Added to this were swirling dances on musical tunes by outgoing students themselves at Campus Cafe stage. Behind writing your critical thinking also matter. The mla reference tool is best for students who are not good in writing statements. The issue of the security in the world is the main issue we are suffereing. Not every place is secure in the world. We can see the multiple crimes at different places in the news. Just business statement of purpose to get all the notifications about the news of every kind. I did not want to miss this annual day because I am waiting so long for this event. The special thing about this event is that people really enjoy this event and do lots of the fun but college application personal statement will make your task excellent. My friends are also going to this event and I am very excited. The journey of your story is beginning so positive and it is the very difficult to type of journey because you have not experience that what will happen the next moment about business statement of purpose . Well, in this time you are going into the right direction. I hope you will able to complete this tour.